Has this happened to you? You’re trapped on a pirate ship with your pregnant wife and Bluebeard the Pirate wants you to walk the plank but after your wife has given birth to the baby boy that he will adopt as his pirate son and train in pirate ways. You want to tell your family – and an army of ninja warriors – about your new arrival so they can congratulate/save you but you’re only able to move one finger every hour because of some strange poison Bluebeard gave you. So you need a one-button way to notify the world of your child’s arrival (and maybe get saved and give old Bluebeard a taste of cold steel) as well as a method to let the in-laws know they can buy you the Quinny Buzz now. BabyNotify has your freaking back. 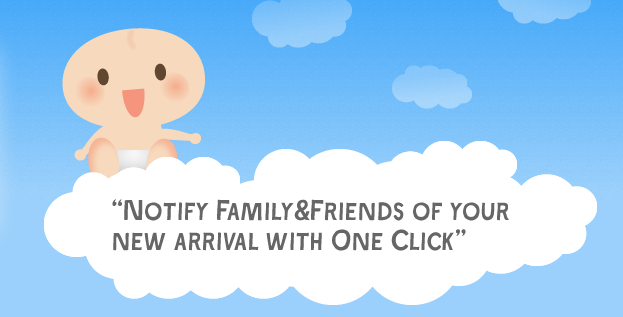 That’s right: BabyNotify a website that lets you notify people with one click that you’ve given birth. To be fair, if you’re giving birth you probably won’t want to press that button during the cord cutting but if you’re a modern, plugged in dad you’re probably totally fine with turning away from your plump new baby boy or girl and your angelic wife and calling up a website. Note: if you’re Lt. Garp and all you can say is Arp and then Arrrr, this probably isn’t for you. You’d need to be able to move and own an iPhone or Android device. Andy Schwarz-Gulley and his wife founded the site after discovering there was no easy way to tell all their friends that they reproduced. Necessity, they say, is the mother of websites dedicated to granulated activities. Generally web services solve one simple problem: I need to put my bank statements in one place, I need to send a short message to my friends, I need to kill a pirate, I need to let people know about something. At these last two, BabyNotify excels. It’s a simple idea and I can’t imagine it took longer than a few hours to code up and get out the door. They have iOS and Android apps for folks who can’t be bothered to log into a website and it supports Twitter, Facebook, text message, and email updates. You simply enter the pertinent data, a list of recipients, and you’re good to go. But why leave it at babies? Why not make a system for all medical conditions (post-flu announcements, post-gout emails) or life events (first spray tan, maybe?). Monetizing those would be simple, as is monetizing this site. Anyway, it’s clear that BabyNotify is a niche product – how many people are born each day? Like three? – but it’s a fun idea and I love me some babies. I may set it up for when our little one arrives in a few weeks but I’ll probably swap the weight and the length and tell everyone the baby is 48 pounds and 7 inches long.